5 miles on the schedule today.....done! It's going to be hot the next few runs. Warm run today - already 70's at 5am! We'll the chances of winning the Hydrapak Softflask were really good this time around. 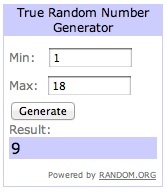 There were only seven people with 18 comments that entered the giveaway. I sure hope this is not an indicator of how my followers hydrate!! Comment nine was Erika. Congratulations Erika. For those of you that might now follow her, Erica runs a blog called This Spartan Will! She's currently training for her first Ironman. Yikes! Erika - please send me an e-mail with your address and I'll get the Hydrapak Softflask out to you. I think you will enjoy it as much as I do. Thanks to Hydrapak for sponsoring this contest. If you want to learn more about their products, please go HERE. Yay! Thank you! And thanks for the shout out too!